George Thomas Wilson (Tom) was born June 20, 1927 in Jordan, Montana to Ben and Jean (Bowe) Wilson. Tom attended a one-room school in Spring Creek, and graduated from the Cohagen School. Tom had an older brother Raymond Ward and two sisters, the older Mary Rickner and younger Patricia Foulk. The siblings worked with their parents on the ranch in northern Garfield County located within the Missouri River Breaks. 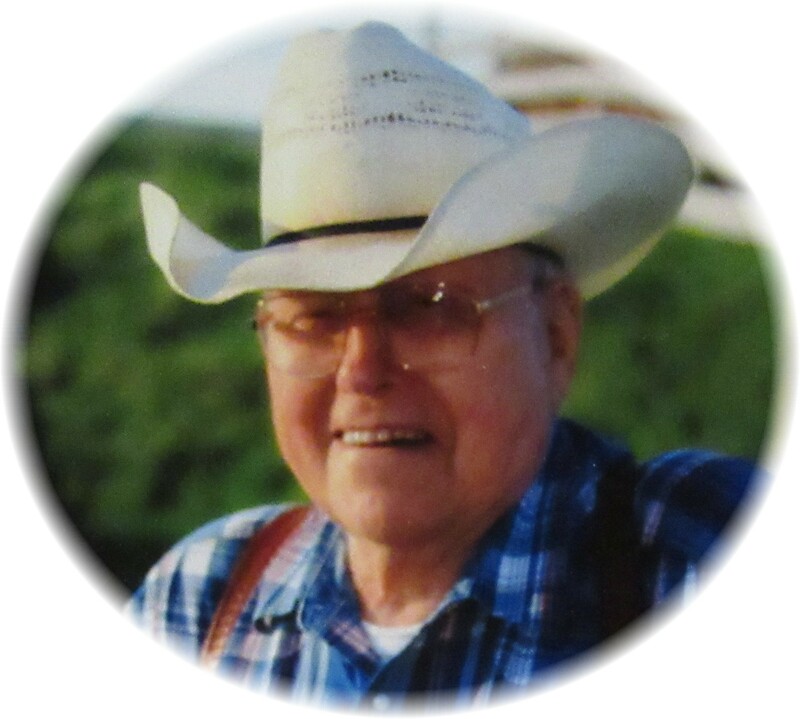 After his father’s death, Tom continued to ranch enhancing his skills as a cattleman and steward of the land growing the original homestead into a substantial property. Tom was the embodiment of the American cowboy culminating in his participation in the Great Montana Centennial Cattle Drive of 1989. Tom was twice married. First to Bonnie Johnson in 1959. The couple adopted three children George, Marcie, and Joe. In 1981 Tom married LaVonne Foss. The couple managed the homestead ranch in Brussett, Montana making hay, calves, and memories. In 1997, they purchased a new ranch in the Judith Mountains outside Lewistown, Montana. Upon their retirement in 2000, Tom moved into Lewistown, Montana where he remained until his death. During this time, Tom was able to reap the rewards of his long labors by engaging in his community. Tom was an accomplished musician playing the harmonica at the Central Montana Medical Center, the Senior Citizen’s Center, the Montana Cowboy Poetry Gathering, with the Spring Creek Players, and at “Jams” within his home and the homes of others. He also enjoyed solving the world’s problems with his group at the weekly coffee bunch at Little Big Man. What was uncommonly special about Tom was his ability to retell stories of life in the “breaks” recounting the early years of homesteading. Tom is preceded in death by his mother, father, sisters, and two children George and Marcie. He is survived by his by spouse LaVonne “Foss” Wilson, son Joe, granddaughter Tanna Eschenko, and grandson Steven Bricks. In lieu of flowers, donations may be made to Zion Lutheran Church in Lewistown or the charity of one’s choice. Fond memories of jam sessions at Tom and Foss’s house in the breaks west of Jordan, and great pot luck meals with the Jordanaires. He will long be remembered in the Brusett and Lewistown communities. I wish to extend my sincere condolences to the family of George Wilson. May you find comfort in you loving memories of George and in God’s promise to see our loved ones again in the resurrection. (John 5:28&29) What joy it will be to welcome back George to a beautiful and peaceful earth! (Psalms 37:10,11,29). I sincerely hope you find these words comforting and they give you the strength and courage you need to make it through this very difficult time. I loved his stories of ranching , hunting, and catching horse thieves in the breaks. He had such a gift to recount memories and lived his life so well. What a gifted storyteller. Thank you Tom, for your music, and your service to our community, and your wonderful irresistible stories. Sincere condolencest to Foss and family. I am saddened to learn of Tom’s passing. His mother and our grandmother were girlhood chums in Scotland. It was that connection that brought Jean Bowe (Wilson) to the Blackfoot country to homestead across the fence from the Crane’s. When I was in my early teens, I was pulling a duckfoot (now called a toolbar) in a field and had only a couple rounds left to finish it when a hydraulic hose blew. The shovels dropped half-way to China, and I didn’t have the strength to reef on the levers to manually pull it up. Tom was tilling the field on his mother’s homestead across the fence and saw my troubles. He came over to help. We got things wired together, shovels up, and he sent me home. “I’ll come over and finish your field for you. You go on home.” And he did. Dad teased me for years about how slick I worked it to have Tom finish my farming assignment! I regret not having the opportunity to sit with him and record his many stories. His passing marks the changing of the old guard in our neck of the woods. I’ll always think of him when I hear a harmonica. He will be missed. My condolences. Not many of the old Brusett Gang left. I have some fond memories of Tom and the Wilson family. I remember the neighbors gathering and playing music at the Wilson’s, Tom would be playing the harmonica and “Old Lee Stafford” playing the banjo and there were others also present. Tom would stop by the house and we would visit, he always had a dog with him. One of my favorites was a german shepherd dog that he had. We were doing some BLM fencing and Tom, Ed Ady and my dad were working on the fence and I played with Tom’s dog. If I only had a picture of one of Tom’s old pickups with the bull rack on the front with chains hanging on it for the front and rear of his pickup so he could cross Blackfoot in the winter time..
One of my last visits I had with Tom I mentioned what a kind person Mrs. Wilson, his mother was to us as kids and the visits his father Ben had with my Grandmother Agnes Crane. These were special times that I will always cherish. Our thoughts and prayers go out to Foss and the Wilson family. Mrs. Wilson, Tom’s mom, was a lovely lady and made the most delicious angel food cake. Ben Wilson, Tom’s dad, gave us kids a calf one time. He often dropped over to visit Granny Crane. I think they both enjoyed a good discussion. My thoughts are with you, Foss, at this difficult time. May you be flooded with good memories that will help heal the loss. We will miss Tom Wilson. He has been a wonderful and trusted friend. One thing about Tom, is that his word was good. He said what he meant (even though quietly), and he did what he said he would do. We will miss him, his humor, his harmonica, and his stories. Our love to Foss and the family. Sending Condolences to Foss and Toms family He will be missed by who knew him. Phil will miss there visits when we are in Lewistown .